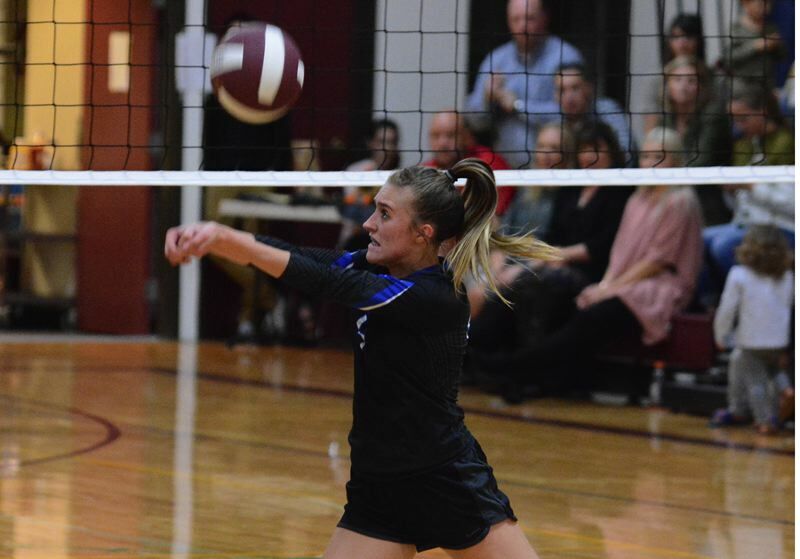 North Clackamas Christian's volleyball team put up a spirited fight before coming up short against Damascus Christian, dropping a 25-18, 21-25, 25-16, 25-20 Valley 10 League decision Tuesday at Damascus Christian High School. Back-to-back aces from Esmaya Hendrickson put the Saints up 14-8 midway through the second set. North Clackamas then maintained its advantage when Nikki Hofer swatted a floater that was left over the middle, but a series of aces by Damascus' Savannah Hale vaulted the Eagles into the lead late. North Clackamas responded with Lauren Brown making a block to return the Saints to the lead, and the tvisitors finished out the set when Natalie Sale won a duel on the right side to gain a split of the first two games. North Clackamas carried that momentum into the third set and jumped to a quick 3-0 lead. But the Eagles rallied and went in front 8-7 when Hale ended a long rally with a kill into the back corner. That started a stretch that saw Damascus win 8 of 9 points to tilt the momentum to its side. Damascus hitter Abbigail Hayes put on an attack from the right side that the Saints managed to get with a diving dig that sent the ball spinning back over to the Eagles' side. Hale saw it coming and launched herself into the air for a powerful kill from the far antennae to convert set point 25-16. "We've been working a lot of quicker sets in practice. We executed that tonight and were able to speed up our attacks," Hale said. The teams battled within a point of each other through most of the fourth set with Dana Dale hitting a winner cross court to give the Saints their final lead at 13-12. Damascus would pull away late in the match when Hayes put together a five-point service run. The Saints turned away the first match point before Brooklyn Bresko hit a cross-court kill to give Damascus the 25-20 win. The teams traded the lead 15 times over the course of the match with Damascus finishing the night with a 96-89 edge in total points.